Free Cash Flow Works - Epoch Investment Partners, Inc.
A principal difference between Accounting and Finance has to do with the time value of money. Since Epoch’s founding, we have defined ourselves as investors who focus on free cash flow rather than on earnings. The quickest way to summarize our philosophy would be to say that it is the ability to generate free cash flow that makes a company worth something to begin with, and it is how management allocates that free cash flow that determines whether the value of the business rises or falls. Our recent white paper “The Capital Reinvestment Story” focused mainly on the second half of that statement —we demonstrated how companies grow their intrinsic value by reinvesting their free cash flow in projects that earn a marginal return on invested capital that is higher than the firm’s marginal cost of capital. In this paper, we turn our attention to the first half of our statement, and ask two questions: 1) Why does free cash flow matter more than earnings in determining the value of a business, and 2) do free-cash-flow metrics help investors identify stocks that outperform the market? I. Why Does Free Cash Flow Matter? Earnings have long played a dominant role in the way that most investors evaluate a company. That is perhaps not surprising; earnings are the best estimate of a company’s profit based on generally accepted accounting principles (GAAP), and they are, after all, also known as “net income.” That sounds pretty definitive. But, as we have often noted, GAAP earnings do not correspond to the actual cash that a business has generated. Rather than tracking the actual flow of cash, GAAP accounting seeks to match up related revenues and expenses as closely as possible in time, even if the cash flows associated with those revenues and expenses occur far apart in time. It does this through the creation of accruals — i.e., recognizing revenues or expenses for which no cash has actually changed hands yet. Depreciation expense is nothing but the flip side of this logic — deferring the recognition of a large cash outflow that has already occurred into a series of expenses extending well into the future. You can certainly understand the logic behind these rules, and at first glance it may seem that they should not matter much to investors evaluating a company. Take depreciation, for example. Suppose a company spends $10 million on a new factory. Does it really matter whether we account for that with a $10 million charge in the year the factory is built or with a series of one million dollar charges over ten years? Either way, it is a $10 million expense, right? Wrong. The difference between these two ways of thinking about the cost of building that factory has to do with the central concept of finance: the time value of money. Just as a dollar of revenue a year from now is not equal to a dollar of revenue today, a dollar of expense a year from now is not equal to a dollar of expense today. This is why we at Epoch so often talk about the difference between accounting and finance: GAAP rules ignore the impact that moving the recognition of cash flows around in time has on present value calculations. Table 1 shows how the project would look under GAAP accounting rules. Because the factory will last for ten years, its cost is allocated across those ten years, and the company recognizes $1 million per year in depreciation expense (assuming that the company uses straight line depreciation). Factoring in the costs of materials and labor, this comes to $2.2 million in annual expense versus $2.5 million in revenue, producing $300,000 in net income each year. In the right hand column, we have shown the present value of these annual income figures, discounted at 5% per year. In this example, we have chosen the number somewhat arbitrarily, but in real life, where does that discount rate come from, and what does it reflect? You can think of it in two ways. From the point of view of investors supplying capital to the company, it represents the return that they could be expected to earn on their money through similar investments. Depending on whether they are supplying debt or equity capital, and on the nature of the cash flows being discounted, in some situations it might make sense to use a risk-free rate like the yield on Treasury bonds, while in others it might make sense to add a premium on top of that rate to reflect the riskiness of the project. To the investors, the discount rate is essentially the opportunity cost of investing in this company rather than in something else. From the point of view of the company itself, it represents the cost of capital associated with the project. As shown in the right hand column of Table 1, the project generates positive net income every year, and the total present value of its accounting earnings is just over $2.3 million. Smart company management should approve this project, should it not? Perhaps not. Table 2 shows how the project looks when we consider the actual cash inflows and outflows that take place each year. From a cash flow perspective, the $10 million required to build the factory is an immediate cost (referred to in the table as occurring at “time zero,” meaning the start of the first year). In addition, the firm will have to spend $400,000 up front in order to obtain the materials needed to produce its product for the first year. So the firm faces a total cash outflow of $10.4 million at the inception of the project. In years 1 through 9, it spends $800,000 on labor (for the current year) and $400,000 on materials (to have on hand for the following year). In year 10, the firm must still pay for labor, but does not have to spend money on materials, as the project will end after ten years, so there is no need to replace the materials that are used in that final year. Meanwhile, $2.5 million in revenue comes in each year. The “Net Cash Flow” column shows the resulting amounts of actual cash that flow in or out each year, and once again, the final column shows the results of discounting those cash flows back to present value terms at a 5% interest rate. If you compare the figures in the bottom row of Table 2 to those of Table 1, you will note that the nominal totals for plant construction, materials, labor, and sales are all unchanged: the plant costs $10 million, and over ten years the company will spend $4 million on materials and $8 million on labor while generating $25 million in revenue, for a net cash flow of $3 million. And that $3 million in net cash flow, in nominal terms, corresponds exactly to the $3 million in total net income that the project will generate over ten years. But, while Table 1 said that the $3 million in GAAP net income had a positive net present value of over $2.3 million, Table 2 shows that the actual cash flows associated with the project have a negative net present value of -$116,000. In other words, this project will reduce the value of the company, despite generating over $3 million in what GAAP rules say is net income. What accounts (no pun intended) for this discrepancy? The answer has to do with the time value of money. By pushing the recognition of the construction expense out into the future, GAAP rules reduce the present value of that expense. The accrual view has the company spending $1 million each year for ten years on construction, yet even though that comes to $10 million in nominal terms, the present value of those ten $1 million charges is only $7.7 million. But the company actually has to spend $10 million today, not $7.7 million, to build the factory. So accounting rules have the effect of reducing the expense of building the factory and making the project appear to be profitable. A manager who relies on the accounting view may well end up approving a project that is going to reduce the real value of the company, even as it adds to the company’s reported earnings. If you think that is unlikely, keep in mind that many managers are paid based on corporate earnings, not cash flows. It may seem counterintuitive to say that a project that generates positive net income is lowering the real value of a company, so let’s explore what that statement really means. Once again, the answer has to do with the time value of money. Consider what the balance sheet for the project we have been discussing would look like over time if we treated it as a standalone business, as shown in Table 3. We assume here that the company issues $10.4 million in new stock one morning to generate the cash it needs to pay for the factory and for the first year’s materials. The first section of Table 3 shows that after the stock issuance, the balance sheet has $10.4 million in cash and $10.4 million in shareholders equity. That afternoon, the company pays for the construction of the factory (which, amazingly, is finished that same day) and for the raw materials. The company now has no cash, but has $400,000 in inventory and $10 million in net plant and equipment (since there has been no depreciation expense yet). At the end of the first year, the company will have generated $1.3 million in cash, as we saw in Table 2 — it will have taken in $2.5 million in sales, and will have paid out $800,000 to its workers and $400,000 to buy more raw materials for the next year. Its balance sheet will now show $1.3 million in cash, and the same $400,000 in inventory as before. Because it will have taken a $1 million dollar depreciation charge to reflect one tenth of the cost of the factory, the net plant and equipment will have fallen to $9 million. Meanwhile, on the right hand side of the balance sheet, the $300,000 in net income shows up as retained earnings. The size of the balance sheet has grown from the original $10.4 million to $10.7 million, reflecting that $300,000 in net income. Skip ahead to the end of year 10, and the balance sheet will look like the bottom section of Table 3. The company will have $13.4 million in cash, no inventory, and the plant and equipment will have been fully depreciated to zero. On the right hand side, the ten years of net income show up as the $3 million in retained earnings on top of the original $10.4 million in shareholders equity. As Tables 1 and 2 showed, the net effect of the ten years of operations has been to generate $3 million in cash on top of the original $10.4 million that the company raised in its stock offering, reflected as $3 million in retained earnings on the balance sheet. Remember, the discount rate we use to derive present value represents the cost of capital — i.e., what investors could earn by putting their money in something else. In this case, since it was equity capital, the discount rate would reflect the expected return on the broad stock market, and the results indicate that the company performed worse than the average company. In which case, an investor who participated in the stock offering would have been better off investing in an index fund; the company’s decision to build and run the factory reduced the value of the investor’s wealth relative to what that investor could have achieved by owning the average company. Looking at this situation from the perspective of capital allocation, we have specified that the company has a cost of capital of 5%. Now think about what kind of Return on Invested Capital (ROIC) the company earned on this project. It generated $300,000 in income each year on an invested capital base of $10.4 million. That works out to an ROIC of less than 3% per year, more than 2% below the cost of capital. That’s why the project reduces the value of the company in real terms. One last point before we move on: suppose that instead of issuing stock to fund the new factory, management could have built it with $10 million in existing cash that had been generated by other operations. Would that make any difference in the analysis? In other words, is cash “free,” with no cost of capital associated with it? The answer is no. The company could have distributed that $10 million to shareholders through a cash dividend or a stock buyback, and the shareholders could then have put the money to use in other ways. There is always an alternative use of capital, which means that all capital, even cash on hand, has a cost. We noted earlier that compensation for corporate managers is often tied to earnings-based metrics and not cash-flow metrics. In the example we have been considering, those incentives could have led management to go ahead with a project that actually reduced the real value of the business, because the project generated positive earnings. But those incentives can also push managers in the other direction – that is, to reject projects that add to the value of the business. In Table 4 we have taken the same project we have been looking at and revised just one element: the revenues. The plant still costs $10 million to build, and the firm still incurs a total of $1.2 million in labor and materials costs to run the plant every year. But now, revenue starts at a lower level – just $1.2 million in the first year – and grows every year, eventually ending up at $5 million in year 10. This may be implausible for a manufacturing business (i.e., how can you grow your revenues that much without also incurring greater costs for materials and labor? ), but it could easily describe a service business. Think of a firm that operates an internet search engine, and generates its revenue from advertising. It spends $10 million to build a building to house its operation, and the building costs $400,000 per year to operate (electricity, heating oil, and so on). The firm pays its employees $800,000 per year. A firm like this could see its revenue grow in the way we have shown here if its search engine became more and more popular, without seeing its operating or labor costs necessarily go up. In this case, starting this business would generate positive net present value of almost $1.9 million over the ten years, and the cash flow turns positive in year two. How would this revised scenario look on an accrual basis? The figures are in Table 5. The key thing to note is that while the present value of the earnings stream is still positive (and is also still greater than the cash flow view, because the startup costs are being spread out over the ten years and then discounted), the company will have negative earnings from the project in years one, two, and three, and will only break even in year four before starting to see positive earnings in year five. In the original example, the project generated positive earnings every year. The reason that earnings don’t turn positive until year five in this example is that the revenue starts out at a lower level. This is offset, of course, by the fact that the revenue grows to much higher levels in the later years, so that the total earnings over time are much greater than in the original example. So the project looks good on both a cash flow and an accrual basis. Surely the firm should go ahead with the project. Once again, though, consider the point of view of the managers who are making the decision, and assume that net income drives their compensation. This project will generate negative GAAP earnings for its first three years, and will break even in year four. Management might worry that the board will replace them, or that activist investors may seek to oust them, before the project has had a chance to start generating positive earnings. So here we have a case where even though the project increases the value of the company when you look at the net present value of the cash flows, and even though the cash flow turns positive three years before the earnings do, management may reject the project. The point of these hypothetical scenarios is straightforward: because the rules behind GAAP earnings ignore the time value of money, those earnings are not an accurate measure of whether a company is creating value. Management needs to focus on cash flow in order to make sensible decisions. Similarly, an investor who evaluates a company based on its accounting earnings may come to the wrong conclusion about a company’s value compared to one who focuses on how the company generates and uses cash. This is why Epoch focuses on free cash flow. II. Do Free Cash Flow Metrics Work? It’s one thing to be able to demonstrate the superiority of free cash flow over earnings on paper; it’s quite another to show that free cash flow should matter to investors in the real world. We turn now to the practical question of whether focusing on free cash flow can help investors outperform the market. 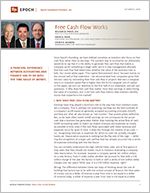 To answer that question, we examined the predictive ability of two different measures of free cash flow. One is a measure of value (trailing free cash flow yield) and the other is a measure of growth (trailing trend growth in free cash flow). Note that neither measure involves any forecasts of future free cash flow, but both rely instead on trailing figures. We will start with the tests we performed on free cash flow yield. First, some particulars. We looked at the efficacy of free cash flow yield in several universes of stocks: the Russell 1000, the Russell 2000, the Russell 3000, and the MSCI World indices. The time period that we examined varied depending on data availability; for the three Russell indices, we looked at the period from 12/31/89 through 6/30/16, a span of twenty-six and a half years. For the MSCI World index, the examination covered exactly twenty years, from 6/30/96 through 6/30/16. We used each stock’s trailing one-year free cash flow at each month-end to calculate a free cash flow yield for that stock; the free cash flow numbers were based on a 45 day lag to take into account the delay before the figures are reported. Perhaps most importantly, we normalized the figures by industry and, in the case of the MSCI World universe, by country as well. We did this so as to isolate the impact of free cash flow yield from industry and country effects. For example, if every drug stock had a higher free cash flow yield than every bank stock, but the banks ended up performing better than the drug companies over the next month, that may have reflected a change in interest rates more than any effect of free cash flow yield. By normalizing within industries, we eliminate such industry impacts. We sorted the stocks on these normalized rankings as of each month-end, divided them into quintiles, and then calculated the return for each quintile over the subsequent month. We equal weighted the returns, because we felt that equal weighting comes closer to matching what actively managed portfolios look like than capitalization weighting does. Table 6 shows the results for the stocks in the Russell 1000. The stocks in the top quintile outperformed the overall average by roughly 5% per year, while the stocks in the bottom quintile underperformed the average stock by about 6% per year. The top quintile exhibited slightly more volatility than the average stock, but not dramatically so, while the bottom quintile stocks were actually the most volatile. Stocks in the second quintile outperformed by 1.5% per year, while quintiles 3 and 4 were roughly in line with the overall average. The three middle quintiles exhibited modestly lower volatility than the universe as a whole. Figure 1 shows the cumulative relative performance of each quintile versus the overall average, and it makes for an impressive picture. (A word on how these performance charts work. They show the ratio of the value of a dollar invested in each quintile to a dollar invested in the average stock. When a line is rising, it means that quintile is outperforming the average stock; when it is falling, the quintile is underperforming.) But note that as remarkable as the cumulative results are, they do not mean that the top quintile outperformed each year. In fact, of the 26 full calendar years included in the chart, from 1990 through 2015, the top quintile outperformed in 17 years and underperformed in 9 years. The reason that the cumulative results are so strong, even with the top quintile underperforming roughly a third of the time, is that when the top quintile did underperform, the margin tended to be small, whereas when it outperformed, it sometimes did so by wide margins. It is also worth noting that 2015 was one of those 9 years in which the top quintile underperformed, by about 2.4%. In addition, the top quintile underperformed for three straight years from 2010 to 2012, though by less than 1% in each year. Nevertheless, the most recent five year period, ending 6/30/16, ranks as one of the worst periods of relative performance for the top quintile. Source: FactSet, Epoch Investment Partners. The results for the Russell 2000 and Russell 3000 were even more dramatic. Within the Russell 2000, the top quintile of free cash flow yield stocks outperformed the overall average by 8.7% per year, and the bottom quintile underperformed by 10.8% per year. Once again, the bottom quintile had the highest volatility as well as the worst performance. And in this case, the top quintile actually had volatility that was right in line with the overall universe. The Russell 3000, of course, is simply a combination of the Russell 1000 and the Russell 2000, and since we were equal weighting the results in our tests, the results for the Russell 3000 were in between the results for the Russell 1000 and the Russell 2000, skewed more toward the results for the Russell 2000. Within the overall Russell 3000 universe, the top quintile outperformed by 7.5% per year with market-like volatility (actually slightly lower), while the bottom quintile underperformed by 10.0% per year and had the highest volatility of any quintile. The performance tables and charts for the Russell 2000 and 3000 are shown in the appendix. Turning to a global universe, we found that free cash flow yield was an effective predictor of performance within the MSCI World index as well. As Table 7 shows, for the twenty-year period ending in June of 2016 (a different period than the one covered in Table 6 for the Russell 1000), the most attractive quintile of free cash flow yield stocks outperformed the overall universe average by 3.4% per year, while the bottom quintile underperformed by 3.7% per year. As we saw in the other universes, the least attractive stocks also experienced the highest volatility. Figure 2 shows the cumulative relative performance of the five quintiles and, as was the case with the Russell 1000, the top quintile, while compiling by far the best long-term relative performance, has struggled to outperform in the last five years, even as the bottom quintile has continued to underperform. We should note that none of these results include the impact of any transaction costs that would be needed to turn the portfolios over each month, and therefore they should not be taken as indicative of the actual results that an investor could achieve. They certainly indicate, however, that using free cash flow yield as an indicator of valuation can be helpful to an active manager. We’ve looked at how well free cash flow yield predicts subsequent performance. How about free cash flow growth? Do historical growth rates in free cash flow give us any insight into future performance? Our second set of tests examined that question, using the same universes and time periods as we used in our free cash flow yield tests. We calculated a free cash flow growth rate for each stock over the trailing five year period as of each month-end. In calculating free cash flow growth, though, we did not use the point-to-point change between a stock’s free cash flow at two points in time separated by five years, because that does not necessarily give the most accurate picture of what the trend has been. Rather, we calculated a trend growth rate, by incorporating the company’s free cash flow for each of the trailing five years. Think of it as plotting those five numbers on a chart, moving from left to right over time, and then finding the line that best fits those data points. The slope of that line is the trend growth rate. Once again, we normalized the results by industry and region. As before, we have included the equivalent tables and charts for the Russell 2000 and Russell 3000 in the Appendix. To summarize the results, free cash flow growth was more effective at identifying good performers within the Russell 2000 than it was in the Russell 1000, but still not as effective as free cash flow yield. In the Russell 2000, the top quintile still did not perform the best, but it came in second rather than third (the second quintile was again the winner), and the margin of outperformance versus the average stock was still quite large (4.8% per year, compared to 5.7% for the stocks in the second quintile). The fourth and fifth quintiles underperformed significantly. Results for the Russell 3000 were a mix of the results for the Russell 1000 and Russell 2000. Quintile 2 was the best performer, outperforming by 5.4% per year, while quintiles 1 and 3 both ended up outperforming by about 3.5% per year, and quintiles 4 and 5 lagged the average stock by roughly 4% per year. We began by demonstrating the theoretical rationale for why free cash flow is a sounder measure of a company’s performance than its earnings. Over the long term, the nominal totals of free cash flow and earnings will tend to look alike, but timing matters. Accounting measures move the recognition of expenses and revenues around in time relative to when the actual cash flows occur, and do not take into account the time value of money. In the end, though, it is the timing of the cash flows, not the accounting earnings, that matters in determining the net present value of any project and, by extension, the value of the overall business (which can be thought of as a collection of projects). Real world evidence indicates that free cash flow does in fact matter in the stock market. Within every universe we looked at, including US large cap, US small cap, and global stocks, companies with higher free cash flow yields performed better than companies with lower free cash flow yields. Trailing free cash flow growth also provided some insight into future stock performance, with higher trend growth being associated with better subsequent performance, but the results were not as strong or as consistent as the results from free cash flow yield. One other finding of note was that over the last five years, companies with high free cash flow yield have not been able to outperform by the same margin that we saw in earlier years. We suspect that the US Federal Reserve’s “quantitative easing” (QE) policy had something to do with this phenomenon. As we have discussed elsewhere, QE distorted the historical dynamics of the market, and resulted in lower quality stocks (i.e., companies with less earnings stability, more leverage, and lower return on equity) outperforming higher quality stocks for a large portion of this time period. We have no way of knowing whether this is a permanent change, but think it is reasonable to believe that in the absence of QE, the historical pattern will reassert itself. It is worth noting that even during this period in which stocks with the highest free cash flow yield have essentially matched the market, stocks with the lowest free cash flow yields have still underperformed. Thus, despite the distortions that QE introduced to the market, free cash flow yield was still a useful tool for helping managers identify stocks to avoid, which in its own way can be another source of outperformance. Taken together, the theoretical logic and the empirical evidence make a convincing case for relying on free cash flow as a key metric for investment decisions, and demonstrate the rationale for Epoch’s investment process. Source for all graphs and tables in Appendix: FactSet, Epoch Investment Partners.